A screen is a technology, within filters, that is embedded to serve two primary purposes – as a form of large strainer used in water intakes and wastewater treatment, and also as a means to separate solid particles of varying sizes that are mixed together. These mixtures could be dry or in a liquid state. Although, there is always some amount of commonality between strainers and screens, the usually apparent difference is the size of the latter is larger and the purpose of the device. For example, strainers are generally used as a means to protect the filter and discard the larger particles within a system of flow. On the other hand, screens are used to distinguish and divide between particles, based on their size. 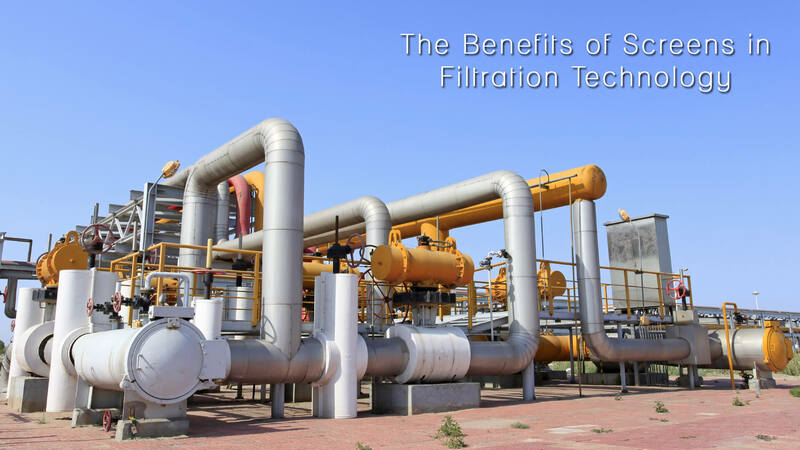 Furthermore, there are several filtration installments, where screens are used as a filter to separate solid from the liquid, specifically to dewater wet solids. When it comes to the process of filtration, both screens and strainers are created through the use of perforated plates, woven wire or wedge wire bards that are designed with rough wire entangling. The exception to this is a woven wire-based media that is created, often, with a mesh that is down to 25m, usually for test sieves. The other properties of screens include a metallic material (as plastic decreases the strength of the screen). If the screen is created in plastic, however, it could however, add to value through cost and corrosion resistance. Within large-scale water handling systems, a wide variety of screens are installed for the purpose of separating solid particles from water. For example, in pumps where water is taken from rivers, lakes or the sea, screens are deployed to separate the debris that comes in along with the water from the above-mentioned water bodies. It is important to note, however, that the functions of the screens are not replaceable by those of a strainer and vice versa. Moreover, the type of screen that is most appropriate to install is dependent on the specific location and the type of separation that is required. For example, to separate weed or grass from sea water required a different type of screen that can resist the passing through the mesh and clogging issues as well. Another use of screens is to separate large inorganic solids from sewage and industrial wastes. The process is the same, wherein solids are held back on top of the mesh of the screen and need to be routinely cleared to safeguard against clogging. Methods of clearing the screen usually include scraping, raking or the deployment of moving screens. Stationary screens are usually vertical grills of rectangular shapes that are spaced at a gap of 25mm or less. The rake allows for cleaning by using the teeth the expanse the gaps between the bars and thereby removing the solids that have accumulated on the wire mesh. It spans across the full width of the screen and can be lifted to scrape and clean the outer surface of the grille by loading off the solids onto the discharge point. Another type of rake, the trash rake, works efficiently for screens that are wider through their narrow shape that can travel along the width of the screen, but can also be raised and lowered on a cable. Its narrow form allows it to wade unguided through obstructions in the water, with its teeth moving hydraulically and alternatively into an open and close position. The debris that is picked up through the rake is then discarded out of the top of the screen. One distinct advantage of a back-raked screen is the positioning of the cleaning forks on the clean liquid side of the screen. They move via the screen from its back, while lifting the separated solids away from the screen. This cleaning rake is then parked on the uppermost side of the travelling route. This rake is activated when the water level reaches a certain height or through the placement of a timer. A geared motor powers a wheeled carriage that is attached to the rake that then undertakes the cleaning process. When the rake is moving in a downward fashion, it stays in a retracted form, and when it reached the lowermost point, the counter-balance pushed the rake into the bar spaces. In the event that the rake fails to engage, due to heavy loading or other causes, the upward motion of the carriage enforces its movement on the rake and pushes it into position. Finally, the forks collect the solids from the screen and lift them up into a discharge chute, wherein a hinged wiper supports the deposition of the solid particles into the chute. The screening surface, of a travelling screen, is embedded with several hinge-connected panels, shaped like baskets, which droop vertically through the support of guides. These baskets are then ascended via chain drives. These screens are then raised one after the other and carry the collected debris to the top, where it is cleaned out through a blast of water. These screens are then positioned back to their original spot. This cycle works continuously through the process of vertical lifts and drops. With the technological advancements towards the efficiency in continuous self-cleaning screens, significant improvements have been noticed toward the filtering process of debris from water, wastewater and slurries. These can usually be optimized to accommodate any set of conditions. In river systems, the screen cylinders are normally placed parallel to the flow of the river as an aid to the system. In reservoir systems that have a varying amount of water depth, different types of intake screens are installed for extraction of differing water levels. Due to the problem of biofueling in marine intake systems, copper-nickel materials are used to resist potential encrusting and screens are positioned in a manner that minimalizes access to debris for effective and continual functioning. Another way is through the method of air flushing. This process releases a quantified burst of air into the screen that pushes the accumulated debris out of the screen and makes it flow away. As opposed to the above-mentioned stationary screens, these screens have the rotating function, wherein the screens rotate and screen the solids in a continual fashion based on the relevant screen that is submerged at any given time. The solids that are trapped within each screen are flushed out as the screen touches the surface. These are then washed off through a sludge collector. These types of screens are sometimes also called disc screens, measuring 2-4.5m in diameter. Its structure consists of a big frame that is embossed with two circles of wire mesh that comes together and is sealed at the circumference and put up on a hollow shaft. This screen is placed on a flow channel. The solid particles are disposed through the rotation mechanism and the heavier solids are taken away through buckets. The screen is thereafter, cleaned through a blast of water and the solids are moved to a disposal trough. Ideally, these screens, due to their simplistic design, are effective in the removal of finer solids and in shallow water. Through the use rotating drum screens, made from a sheet of wire mesh and mounted on the outer section of a cylindrical drum that rotates on a horizontal shaft, the system works to remove solids through a washing mechanism. A more intricate version of this screen involves a micro-strainer, which flows from the inside of the drum, trapping solids that are as low as a few micrometers. These screens have a dilute suspension that is placed inside the drum and the liquid seeps through the screen, causing the solids to fall at the lowest point of the drum and drain away by overflowing at the end of the drum. These types of screens are widely used in sewage treatment, pulp and paper processing, and the separation of fruit and vegetables from their pulp. They are sleeve-like units embedded at the ends of intake pipes in water or oil wells. They are made up of a cylindrical tube that is closed at one end with a porous kind of material on the walls that are placed toward the end of the suction pipe, where the screen is installed. These screens restrict the entrance of particles of rock from the drill site that is extracting water or oil.